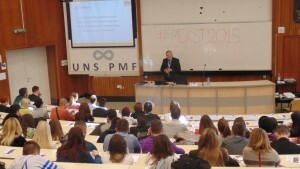 The [email protected] took place on the 29th of November 2015 at University of Novi Sad as a special event within the annual International Tourism and Hospitality Student Congress in Novi Sad (#MEKST2015). Divided into two sessions the event was fusion between e-tourism academia and industry on one side, and students on other side. 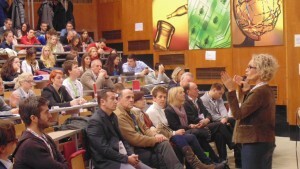 The event attracted an audience of more than 300 people from 11 countries who joined the event in Faculty of Sciences, University of Novi Sad. The first lecturer was IFITT representative and former president dr Andrew Frew, professor emeritus at the Queen Margaret University in Edinburgh. Professor Frew talked about ICT and sustainability in Tourism. Second lecturer was Mitja Petelin from Vocational College for Catering and Tourism in Maribor, Slovenia. His topic was the “Web 2.0: The Challenge of Generations”. After lecture of Nebojsa Petkovic, ICT manager in the National Tourism Organisation of Serbia, who talked about social media project called #MySerbia and implementation of Social Media Wall into NTO website, first session was concluded with Q&A session. After Coffee Break started the second session of [email protected] with Milica Manic as the first lecturer. Miss Manic is the youngest lecturer of #MEKST2015, representing International Student Week in Belgrade. She talked about smartphone applications for their international guests and relation of IT and Tourism on the ISWiB case study. Ana Asanovic, author of the @travelgirlbgd was lecturing about “Significance of Travel Blogs in Tourism Industry”. With interesting approach miss Asanovic indicates the problems and advantages of (travel) blogging in tourism industry. The event was concluded after a networking and refreshment break.